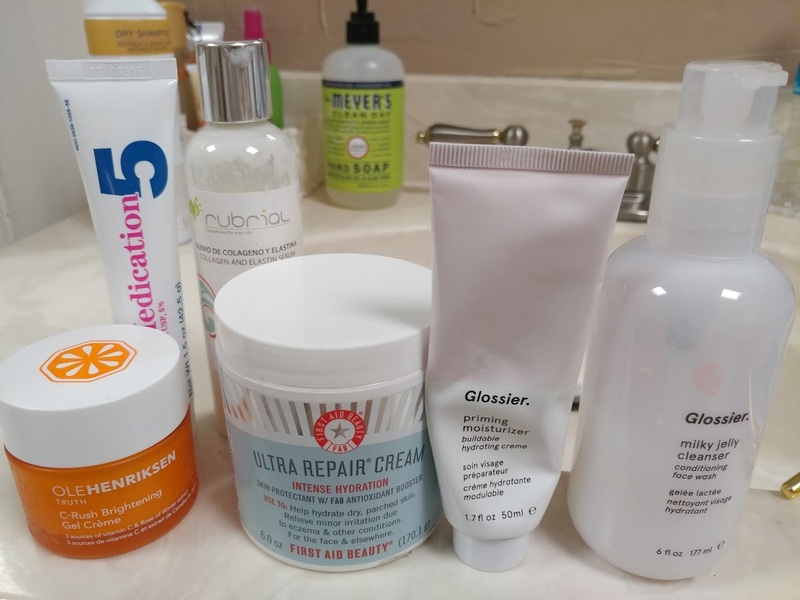 This isn’t my current skin care routine but these were products I was trying out a couple of months ago. I switch them out as soon as they’re done. I also love trying products that people are REALLY excited about just to see what makes them so great. Oh wait! Except for that Ultra Repair Cream, that precious moisturizer is one of my go-tos. I’ve been using it for over a year now. (I require more than one moisturizer because my skin is SUPER dry during the Winter months and Spring). You’ve got skin? I bet cha do. We’ve all got skin! Our entire body is covered in it. We always hear about taking care of our health. Watch what you eat, y’all! Exercise! However, no one ever really tells you anything about how to take care of your skin. They just say “Drink plenty of water and shower!” which are two really good suggestions (you should be drinking loads of water and bathing, btw) but it doesn’t really do much more than the basic care. I won’t go into details about products here because I want to leave that for another post. I do, however, want to give you an idea of what a basic skin routine should include and why. How do we get started? What’s the simplest way to take care of my skin if I don’t even know where to begin. Well, my beautiful curious baby otters, I’ve been pondering with my ponder on tips that will help even the most lost soul into experiencing soft luxurious skin. WASH your face once to twice daily (CLEANSER):We all know there are all different types of skin and ALL of them range in sensitivity. Get to know your skin. Try products and don’t be afraid to try as many as you want. Breakouts happen and tend to happen when you try new products that’s 100% normal. All that means is that you might have had this acne underneath your skin that your previous cleanser wasn’t treating. Now it’s out! Now we can treat. Acne is completely natural and not some freak occurrence. I know it can feel that way, though. But first, you need to get into the habit of washing your beautiful face (not jus bathing). How do I wash it? What do I use? This depends on what kind of skin you have. If you have oily skin, you want a gel cleanser and to wash it with warm water. If you have combination skin, you can alternate between gel or cream (depending on the season and sensitivity) also using warm water. Dry skin? Always use a cream cleanser if it’s sensitive try a gentle cream cleanser. You have acne prone skin? Sometimes cleansers have built-in acne fighting ingredients like salicylic acid and benzoyl peroxide. Try both. See which your skin likes best. For example: I have combination, sensitive skin which HATES any topical salicylic. My skin prefers benzoyl peroxide. I use a cream cleanser during the dry months (winter, fall) but can also use gel during the summer time. TONER: Does it really work? It does! Now, not all toners are created equal. You do NOT want a toner with alcohol (unless you prefer it and have very oily skin) any product with alcohol will cause your skin to dehydrate. It can also be very harsh on the skin so if you have sensitive skin, it may do more damage than good. I prefer moisturizing calming toners that reduce redness and prep the skin for the day. Toners are meant to minimize the size of your pores while priming the skin, prepping it for moisturizer or the day. It’s even really great to just have in your bag as a throughout the day kind of cleanse, alongside a makeup wipe. MASKS or Exfoliate: This step isn’t needed for your every day routine. Once a week is more than enough. You don’t want to over-exfoliate your skin and would be surprised at how many people do. Your skin requires time to heal and grow. It’s just like most parts of your body. If you pick at a scab, does it ever really heal? Think about over-exfoliating as rubbing salt on a wound. It doesn’t do anything to help, it’ll definitely make things worse. I prefer masks as a combo exfoliator and facial treatment because it’s exfoliating but also nourishing my skin which is exactly what you want. If you take away, you must put back in or else you’ll see your skin looking haggard or gray and no one wants that. SERUMS: BUY ONE. Oh, but Mely SERUMS ARE SOO EXPENSIVE. They’re also worth it. Think about it. What is the first thing people see when they see you, it’s your dang face. Take care of the thing. Serums are FULL of wonderful ingredients that not only protect your epidermal layer but feed it. Your skin is an organ. It’s the largest organ in your body. It needs nourishment. What do you want in a serum? That depends! What does your skin need? Anti-aging serum? hydrating serum? color correcting serum? dry skin? They make all kinds! You can also use more than one but we will get to that in a different post. MOISTURIZER: I don’t care if your face is oily af, go buy one and rub it on your face. But Mely, whyyyyy? I mean, my face is super oily already. LOOK YOU, HUUUUUSSSSSH COME HERE LEMME HOLD YOU. Moisturizer protects your skin from the harshness of the world. You know how hoodies make you feel warm and safe. Well, the moisturizer is the hoodie of the skin. A hydrated face is a happy face. Moisturizer will help protect your face from pollutants, dehydration, anti-aging, and even those pesky harmful rays (if it has SPF). Trust me, you will notice a VISIBLE difference when using moisturizer for a week. SUNSCREEN: The sun is wonderful but will also DESTROY YOU. Protect your skin from its harmful rays. One sunburn can age you a 10 WHOLE years. There are no miracle serums or moisturizers(or filler) that will rescue you from constant sun exposure. You’ll want a sunscreen that’s at least 30 SPF.